Odisha is one of the most interesting states in East India. The state is not only famous for its beaches, rivers, waterfalls, hills, forests, wildlife and tribal life, but also for its great tradition of architecture, monuments and sculptures. Some of these monuments date back to the 3rd century B.C. and are well preserved and are intact to this day. The entire state has over 4,000 monuments and archaeological sites which include early Jaina caves and temples, Buddhist monasteries, pillars, Hindu temples, mosques,churches and ancient and medieval forts. 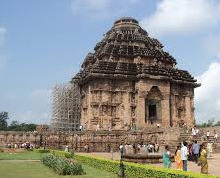 The main tourist attractions of Odisha are the temple towns of Puri, Bhubaneshwar and Konark. Bhubaneshwar, Puri and Konark are easily accessible by rail and road. The Jagannath Temple in Puri, Sun Temple in Konark, Lingaraj and Raja Rani Temple in Bhubaneshwar and Chandrabhaga and Puri Beaches are a few main attractions of the region. Gopalpur-On-Sea, an ancient seaport, is one of the most beautiful beach resorts in Odisha surfing and sailing facilities. Chandipur is undiscovered beach resort and here the sea retreats for several kilometers everyday. Balighat is another beach, where the river merges with the ocean. South of Puri, there is the Chilka Lake. It is one of the largest mixed salt and fresh water lake in Asia which is home to various migratory birds in winter. Odisha has excellent wildlife sanctuaries. Nandankanan is set in the natural wilderness, about 20 km. from Bhubaneshwar. It is a delightful place, and famous all overthe world for its white tigers. Leopards, rhinos, elephants, bears, monkeys, and several other types of mammals can also be seen at close quarters, in their natural habitat. The Similipal National Park is another famous national park in Odisha and is very scenic with its rich valleys and waterfalls. Besides tigers, there are panthers, antelopes, India bison, deer, sloth bear, and over 200 species of birds. The wildlife sanctuary of Gahirmatha, about 130 km. from Bhubaneshwar, is very unique as every September, various Pacific Ridley sea turtles swim from as far away as South America to make this place a nesting ground. Odisha is also famous for its rich handloom industries. Exclusive silk and handloom sarees, bedspreads and furnishings are most sought after. 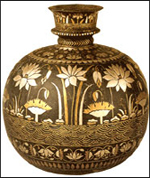 Other than these, cigar boxes, jewellery, and decorative trays with extremely intricate silver filigree work, Pattachitra, the folk painting of Odisha, brassware, Papier mache masks, colourful canopies, awnings and umbrellas with applique work from Pipli are some of the famous items which can be bought from Odisha. Odisha is one of the most accessible states well connected by air, rail and road which makes it convenient to visit any time of the year though the best season to visit is from October to March.